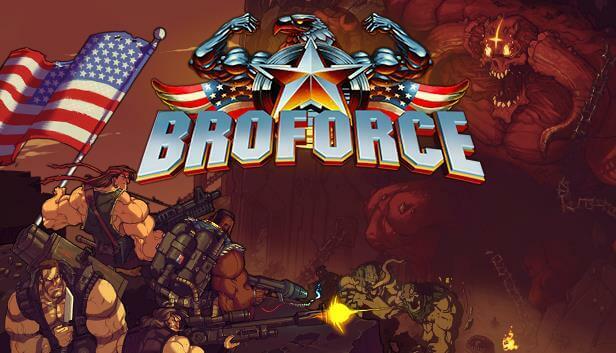 Broforce is part of this month's PSN+ free games promotion. It won its place by getting the most votes in the "Vote To Play" contest that was held last month. I had some interest in it but never enough to pay full price for it on PC. I guess it was never dirt cheap and now I know why. It's a pretty good side-scrolling action game. 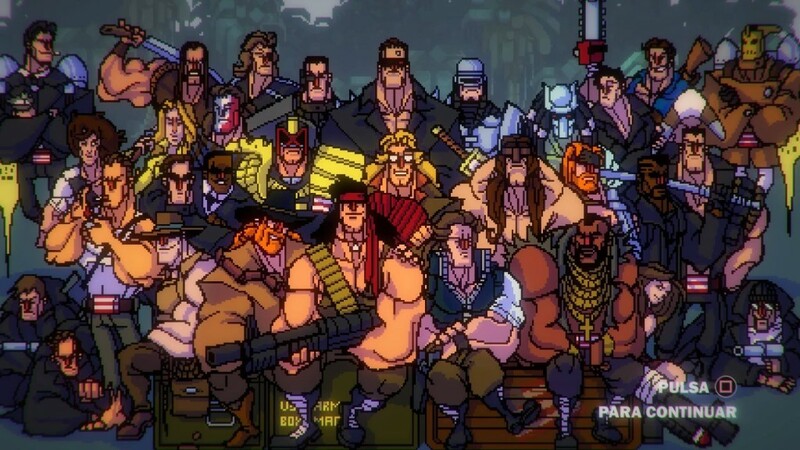 Broforce is a celebration of old-school action movies. We get parody versions of most iconic film and TV heroes like Rambo, Commando, Neo, MacGyver and B. A. Baracus to name a few. All of them play differently. They have different speed, weapons, special moves and athletic abilities. For example, Rambo has a machine gun and hand grenades, Neo is a melee fighter and his special is the red pill which basically turns him into an invulnerable killing machine for a short period of time, Mr. T has a very useful flamethrower and fire grenades which are great for fighting bosses from a distance. When you begin the main story you'll start with only one character, Rambro. You'll be dropped in the jungle by a helicopter in order to liberate the area. You'll do that by killing terrorists left and right with guns blazing, literally. On your way to kill the Devil at the end of each level, you'll find prisoners. If you set them free you'll get a free life and that's the way you'll unlock new characters. For better or worse, when you set free a prisoner, you'll randomly switch to a different action hero. Randomness is a big part of Broforce. After you've unlocked a new character, heroes will be switched every time you lose a life, start a level or set free a prisoner. There's no way of manually changing to a hero of your liking. This gives the game a lot of variety as you have to adjust to to whatever weapons and abilities the hero you have at the moment has. However sometimes you'll feel you need a specific hero for that challenge and let's be honest, some of the heroes are lame. I'm looking at you, Brocketeer. The game exudes American Patriotism. It's taken to parody levels and it feels awkward sometimes. I mean, at one point you'll be playing as European legends like 007 and William Wallace and they will be raising American flags when reaching checkpoints. That was very odd. When you finish a level you get to the chopper, explosions start all over the place and the light in your dual shock 4 controller will start flashing red, white and blue. It's that American. While Leon is not an American, the Brofessional certainly is. The gameplay is pretty simple, just run and shoot. There's no reloading in here. I really liked how this helped the action to flow very quickly. Some other games that have reload like Mercenary Kings and Helldivers really put me off since it over-complicated what should have been quite simpler, in my opinion. I guess I was not the right audience for those. I like how it feels like Contra where you don't have to worry about such detail. Unlike Contra, this title does have destructible terrain which you can use to your advantage to change the path you take to reach your goal. There are some things that I wish the developer had addressed before releasing the game. The PS4 version of Broforce has some bugs that seem out of place in a title that looks like a 16-bit shoot-em up. Each time you restart a level there's like a second or two where your controller won't receive your inputs and your character will stand still vulnerable to enemy attacks. At first this won't bother you much, but in the later levels those seconds could mean life or death. Loading times can reach up to 1 minute in the later stages. I really thought the game had frozen and I would have to restart the console because there was just a black screen with no loading signs and it took way too long to start the missions. There were also frame rate drops when there was a lot going on. You would expect that in a SNES, but not in a PS4 brand new title that looks like it would have been fine in the 16-bit generation. The broforce cast includes some of the most iconic action stars. A couple of Stallones, Norris, Gibsons, Van Dammes and three Schwarzeneggers to name a few. More heroes are still being added. Besides those bugs, it is very much playable and enjoyable. It has a lot of humor and variety. I had a great time playing it and would recommend it to anyone who has an interest in action games with a retro vibe. I tried it in multiplayer, but it felt much better in single player. Just be warned that the last level is a tough marathon. the ending will make it worth it, though. I've been gaming since the 80's. I now enjoy my hobby with my wife and kids. Dreaming dreams no WRUP ever dared to dream before. 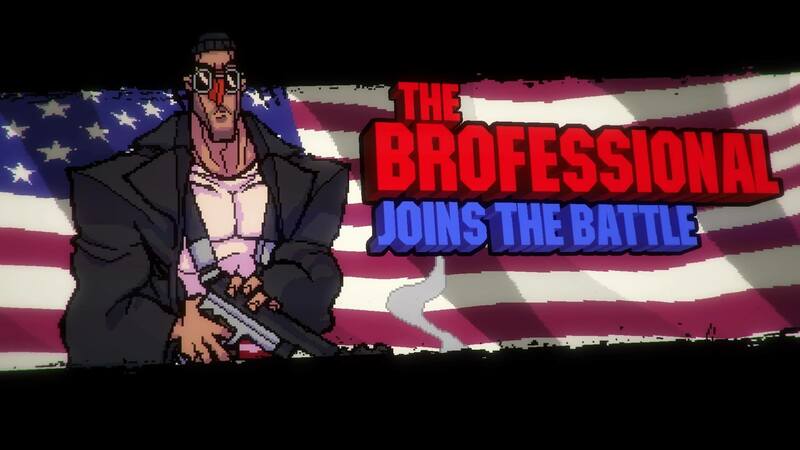 Broforce wears its Contra with pride.